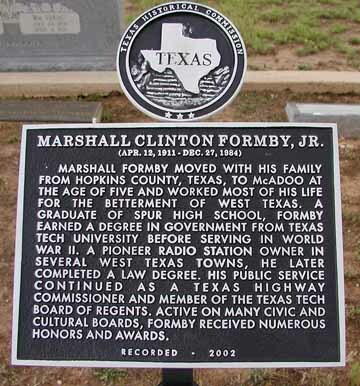 A Texas Historical Plaque honoring the late Marshall Clinton Formby, Jr., Dickens County judge from 1936 to 1940, was dedicated in a ceremony held Friday, June 6, at the Dickens County Courthouse. The plaque has been erected at the McAdoo Cemetery where Formby was buried in 1984. The ceremony, originally scheduled to be held at the site of the plaque, was moved to the county courthouse after the cemetery was flooded during heavy rains on Wednesday and Thursday, June 4 and 5. Friday afternoon's ceremony kicked off the 2nd Annual Dickens County Patriotic Day. Formby's widow as well as a number of family and friends attended the ceremony. His nephew, Texas State Senator Robert Duncan participated in the ceremony along with Clint Formby, Formby's son and business partner. When he was five years old, Formby moved toMcAdoo along with his parents, Marshall Clinton Formby, Sr. and Rosa Mae Freeman Formby. He attended public school at McAdoo through his junior year in high school and obtained a diploma from Spur High School in 1928. He enrolled at Texas Technological College, now Texas Tech University, that same year. His son, Clint, described his father as a person who "swam upstream...and had his mind set on what he wanted to do." And Marshall C. Formby, Jr. did a lot. With a keen interest in journalism, Formby worked for several newspapers including the Plains Progress, Lubbock-Avalanche Journal, Amarillo Daily News, and Texas Tech's Toreador before graduating in 1932 with a bachelor of arts degree in government. Following college, Formby briefly owned and operated a drug store inMcAdoo, traveled widely, and, in 1936, worked as a police reporter for the Miami, Florida Tribune. Formby was affectionately called "Potts" by family members, friends and Dickens County folks. 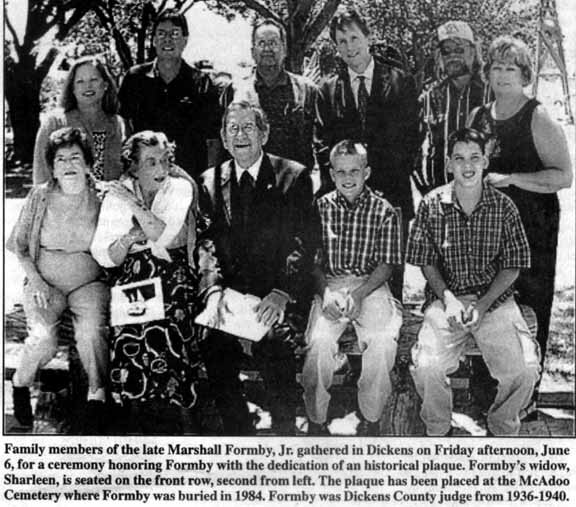 According to the Formby family's submission in the bobok, Dickens County; Its Land and People, when Marshall was about three years old and while the family lived in East Texas, he played in an old iron wash pot in the back yard. Often when his mother called him she could see his head sticking just above the rim of the pot where he had been playing. Since Marshall was named after his father, they had used several names, "little Marshall", "M.C. ", and others and when his mother said "here comes by little boy black as a pot", it was natural that the name "Potts" stuck as it did for a lietime among Dickens County folks and relatives of the Formbys. "Potts" began his political career at the age of 25 when he became the youngest county judge in Texas when he was elected to serve Dickens County in 1935. In Dickens County; Its Land and People, the late Doug Meador, editor of the Matador Tribune told an interesting story leading to Formby's run for county judge; "One morning Mr. Meador looked up and there in his office stood Marshall carrying a battered cheap travel case. He said he was hitchhiking and was going back to school. U.S. Highway 70 was under construction at Matador and traffic was being routed north over Mains Street and around the old golf course. Marshall stood by the bridge across Hackberry Creek until late in the afternoon, failing to catch a ride. He returned to the Tribune office and said, 'I've decided to go back home and run for county judge.' And Marshall probably walked all the way home to McAdoo from Matador that day. He reached a decision while vainly waiting for a ride from a stranger. It was Marshall's entry into public service, a decision for which Texas may always be proud of and grateful for on that historic day. The next day Marshall started making plans to run for county judge of Dickens County." As judge of Dickens County, Formby was a man of high ethical standards, said his son, Clint Formby, during Friday's ceremony. He loved people and politics." said Clint Formby. "He was for the little guy." As Dickens County judge, Formby got the county on a "cash basis for the first time in 15 years", and Dickens County enjoyed the lowest tax rate in 22 years," said Formby's son. 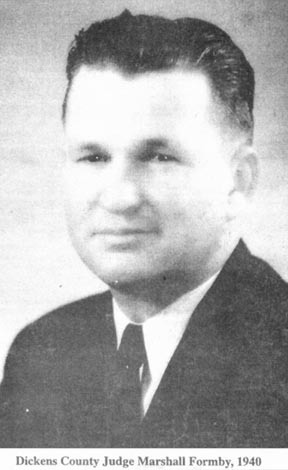 During the time of his four year tenure in Dickens County, Formby was president of the West Texas County Judges and Commissioners Association in 1939 and 1940. Formby left office when he was elected to the Texas Senate from District 30 representing Lubbock. His service inEurope with the Army Corps of Engineers during World War II did not allow Formby to stay in the Texas capital. He was discharged from the Army as a captain, and returned to Austin where he enrolled in graduate school at the University of Texas. He entered the Baylor University School of Law in 1951 and was admitted to the state bar in 1952. He returned to Plainview in 1953 and joined the law firm of LaFont and Tudor. That same year he was appointed to the Texas Highway Commission by Texas Governor Alan Shivers. He held this position for six years, serving as chairman or at least two of those years. Formby drew from his experiences on unpaved farm-to-market roads when he focused his attention on paving them. Formby also focused his attention on building the Texas Turnpike between Dallas and Fort Worth. He also worked with federal officials in launching the interstate highway program. Clint Formby described his father during Friday's ceremony, as "putting the face on ghe Highway Commission." In 1962, Formby ran unsuccessfully for the Democratic nomination for governor of Texas. It was the only political race he ever lost. Formby spent the next 20 years pursuing his law career, various business interests, and civic responsibilities. He served on the board of Regentts for Texas ech University from 1967 to 1971, and was then appointed to the Texas College and University Coordinating Board where he served for two six year terms. "Marshall Formby exemplifies the hard workin, never say quit character of West Texans whom he so vividly portrayed in his novel, These Are My People (1962)...in politics, in business, and in community affairs. Formby represented the small town, rural character of Depression era Texas west of the one hundredth meridian, a place where it seldom rained, the wind always seemed to blow, and settlers met obstacles head on with a gritty spirit and a will to succeed." That was Marshall Formby. and is not for commercial use of ANY type.